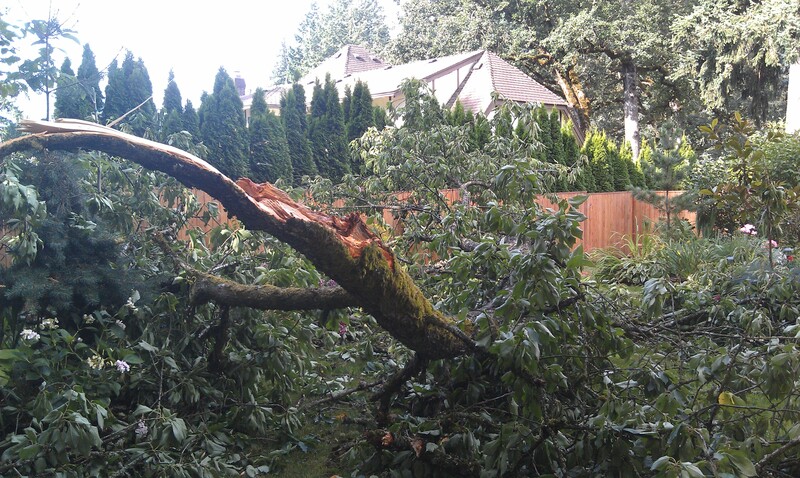 The loud crash of a branch suddenly collapsing onto property has been the unfortunate experience of many of our customers around the Portland Metro area this summer. Sudden limb failure can occur in the warm and windless days of summer when the somber leafy presence of the trees would seem rather to suggest calm and stability. How, then, could they possibly fail at this time of year? The fact that trees shed entire branches in the calm of the summer has long vexed homeowners and arborists alike. A likely cause of these failures is the increased weight of the limbs as they pump water for transpiration and photosynthesis needs. Small defects in the branch or branch collar may become sources of failure when coupled with the added water weight and the challenge of dissipating this water through gas exchange in the leaves. The result is that on the calmest day of the year–often in the afternoon or early evening–the biggest limbs may catastrophically fail. The arborists at Ward Tree Care can assist you in cleaning up a limb or tree failure, but we also provide tree assessments that identify structural weaknesses in the architecture of standing trees so that a mitigation against potential failure can be proposed. Usually, this would mean pruning so that heavy limbs are thinned and end weight reduced. 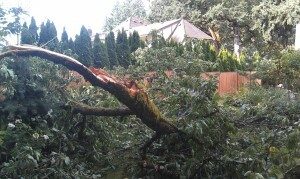 It may also require cable installation or tree removal.